‘Taonga pūoro’ is a phrase describing traditional Māori musical instruments, played here by Horomona Horo on this unusual CD. 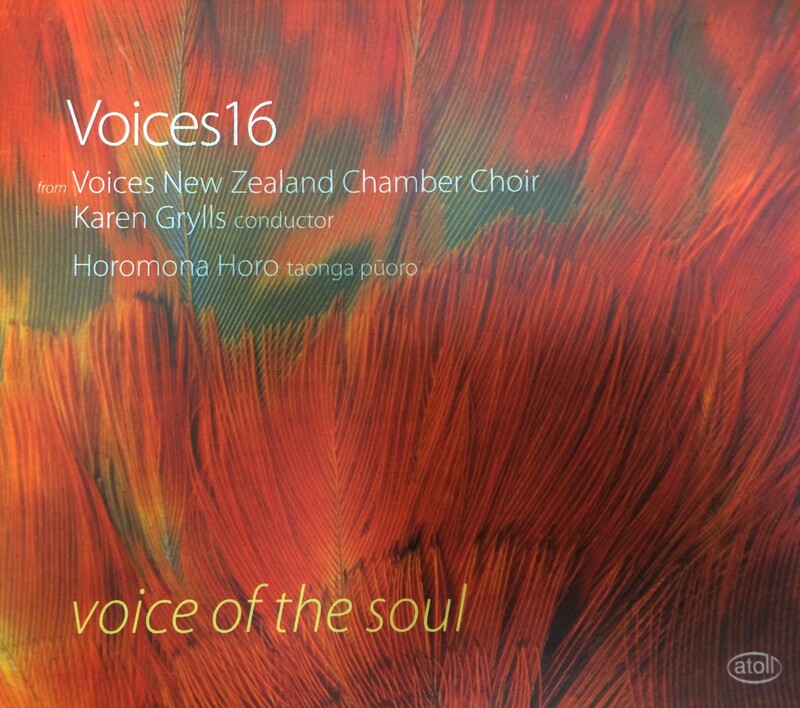 The instruments alternate and sometimes combine with the singers, who are Voices 16, a detachment of the New Zealand Chamber Choir, under their conductor Karen Grylls. The instruments heard include the Hue, made from a gourd; the Kōauau, a flute made from bone; the Pūtōrino, a wooden trumpet; and the Pūtātara, a wind instrument made from the highly prized Titan shell – quite a rarity, I’m told. Be that as it may, it is a beautiful sequence of numbers; David Childs’ ‘Salve Regina’ which follows, gives us our first opportunity to hear this choir singing a ‘conventional’ piece, which they do with great accomplishment. Childs’ treatment is, in its word-setting, highly reminiscent of Poulenc in, for example, the ‘Litanies to the Black Virgin’. I don’t know how conscious was Childs’ tribute to Poulenc; but Morten Lauridsen’s ‘Six Fire Madrigals’ to Italian texts are explicitly inspired by the vocal works of Monteverdi. Those who know Lauridsen’s sacred works, such as the famous ‘O Magnum Mysterium’ will be familiar with the technique used here. He takes a single chord – described by him as the ‘Fire Chord’ and heard at the very beginning – and explores it throughout the six compositions. The shifting harmonies often produce ear-bending effects such that I wondered if I was hearing microtones at some points – which is not to say that this choir sings out of tune. Indeed, their technical assurance is impressive, if unobtrusive. Sometimes though, both in the Lauridsen and later in the Britten ‘Flower Songs’, I wanted a greater sense of involvement, and a wider palette of vocal colours. In compensation, their ensemble, intonation, breath control and blend are exceptionally fine; they sing as one, a tribute to the clarity and musicianship of their conductor.